Dollar cost averaging is an investing term that is sometimes misunderstood. It is a very simple concept that some advisers will condone and others will shun. To put it in it’s simplest form, dollar cost averaging is a strategy in which the investor contributes a fixed amount regularly toward an investment. Many who believe in using dollar cost averaging see it as a way to reduce risk on their investments. Let’s look at an example instead of words…it makes the concept a bit easier to swallow. In this example, I will use a stock that sells (initially) for $50/share. One table shows a $10,000 investment in this imaginary stock, as the price rises and falls, and takes the investor for an emotional ride. 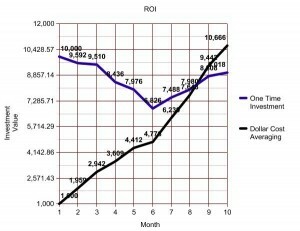 The other table has the same investment amount but the total is invested in $1000 increments over a ten month period, instead of all at once using the dollar cost averaging method. Because the price fluctuated negatively during these ten months, the dollar cost averaging method was actually able to purchase over 36 more shares than if they were all purchased at the same time at $50/share. With those 36 more shares, the dollar cost averaging method yields more than $1600.00 than a one time purchase. The results using dollar cost averaging are not always rosy. If it is profit you are looking for, the slow method can be counterproductive. If this investment had in fact gained during the ten month period, slower would have lost the race. If you ask me, dollar cost averaging is a winner. I have personally know many investors over the past year who have bought the stocks they were already invested in “on sale” using dollar cost averaging. Do you have any experience using dollar cost averaging? If so, how did it turn out? Win or lose, I’d like to hear from you on this subject. Is Ignorance Really that Blissful, or Could it Cost You? Previous post: Why do We Need Financial Hurdles to Overcome?